My name Sefakor means “God comforts” my other name Enam means “God has given”. My life has been a series of testimonies and I have found the comfort of God in times I needed it. I’ve had it good compared to others; being born with Sickle Cell Disease brings many odds that stack against a person, but I have had the love and support of family, friends and an amazing church family which have carried me through even the toughest times. I spent a considerable amount of my earlier years in hospital. I remember being rushed there many times while in basic school. I was prevented from partaking in sporting activities and anything that involved excessive physical activity. In addition, my mom was fussy, which meant being under constant scrutiny and doing a lot to prevent crises. Thankfully, I wrote my BECE without incident. However, a decision was made to keep me in Accra at all cost, close to home or rather, close to hospital. I was furious. My grades were great. My friends were going to amazing schools they had chosen and here I was, stuck in Accra, and without the full range of options I desired. 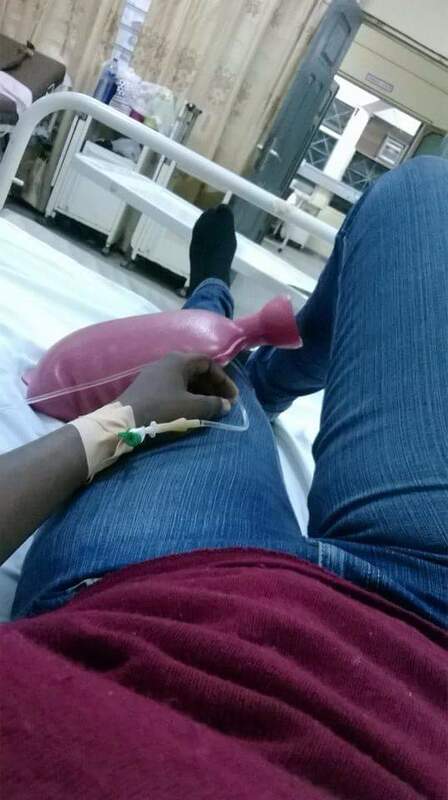 I felt Sickle Cell Disease was going to ruin – or run – my life. As it turns out my mom’s decision to keep me in Accra was brilliant! I started senior high school and stayed in the boarding house but nothing prepared me for the experience. I was faced with a very hostile environment and school authorities who did not make the journey easier. But I thank God for Miss Margaret Nyame who provided me hot water to bathe, warm water at 4:30am for a person living with Sickle Cell Disease is a lifesaver. My time in senior high school was the most unpleasant period in my life. It was a continuous cycle of ill health. I was admitted, discharged, readmitted after a few days only for the cycle to repeat itself. My grades plummeted, I was frustrated, that was the end of boarding school for me. Yet, God came through in grand style. While writing WASSCE I was in such excruciating pain during my core maths paper it is a miracle I passed. I was driven straight from the exam room to the ER where I stayed for three days. I was discharged on the morning of my next paper. I really could not afford to miss any papers. I was trying to get into medical school. By God’s grace I passed and got admission into medical school. Everything that could go wrong did in medical school. 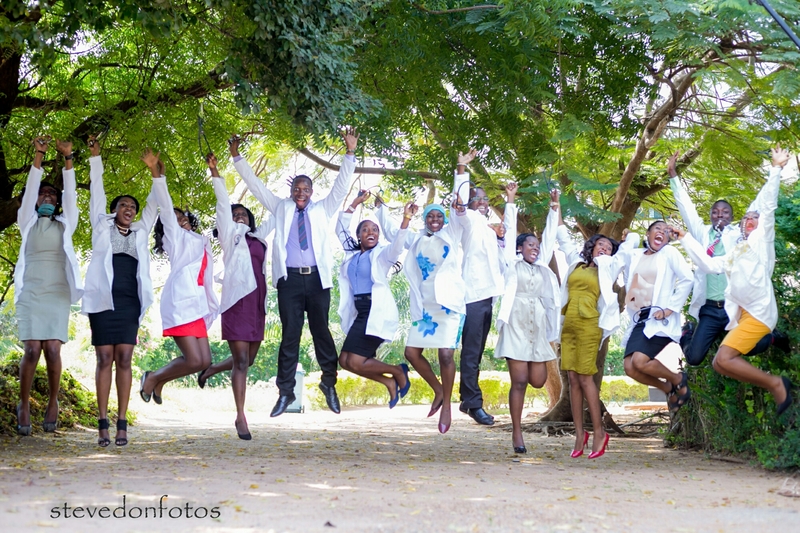 Too many times!Medical school was a repeat of the terrible health cycle from senior high school but this time with new sickle cell disease related complications. I fell ill again when writing my final exams. I resisted getting admitted so hard because I wanted a different testimony. I wanted to be able to say I wrote a major exam without breaking down completely, but God had other plans. My friends had to persuade me to go to the ER on the night before my surgery finals. I was so distraught, but God spoke to me through my doctor. It was simple. Had He not done it for me before? Had I not been admitted during major exams in the past and still passed? Had he not brought me to medical school? All I had to do was believe and have faith. No doubt. This was not beyond Him, nothing is. Based on my experience, I am inspired to encourage people like myself to aim for more and not allow themselves to be limited by this disease. I am passionate about preventing Sickle Cell Disease. I am passionate about sharing the experiences of persons like myself with others to give the public a glimpse of the reality of living with Sickle Cell Disease. I believe I have found my calling. It is Sickle Life. 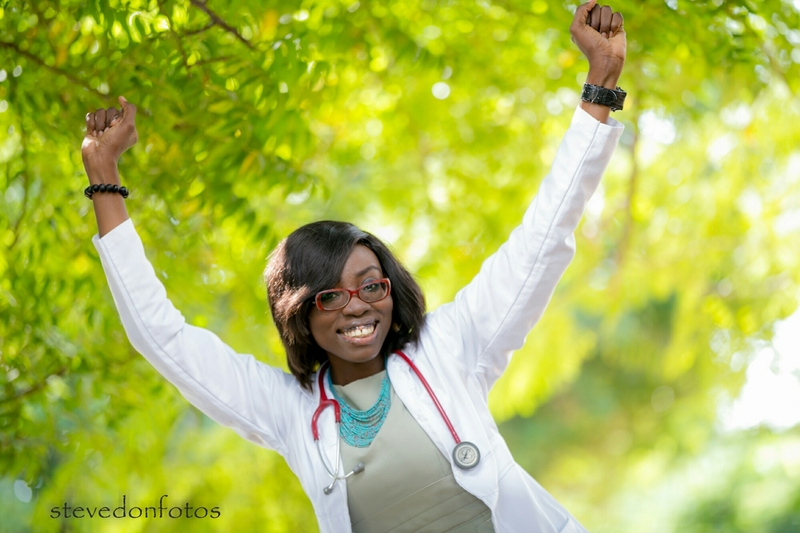 Through Sickle Life I empower people to make informed choices regarding Sickle Cell Disease. The Sickle Life Team achieves its aim through publications on our website, social media interactions, health talks, health screening, and by providing Sickle Cell Testing and counselling. I am challenged to be the change I want to see in the World. I want more attention paid to Sickle Cell Disease on a national and global level. I want more people educated and empowered to make informed choices about Sickle Cell Disease. I want you to opt not to pass Sickle Cell Disease to your child. I want access to comprehensive Sickle Cell Care so I won’t be driven out of the ER when in pain. I want you to care enough about Sickle Cell Disease to talk about it. I want World Sickle Cell Day commemorated in my country. And while I wait to see the change, I work to be that change. I am Sefakor Enam Bankas. I support Sickle Cell Awareness. 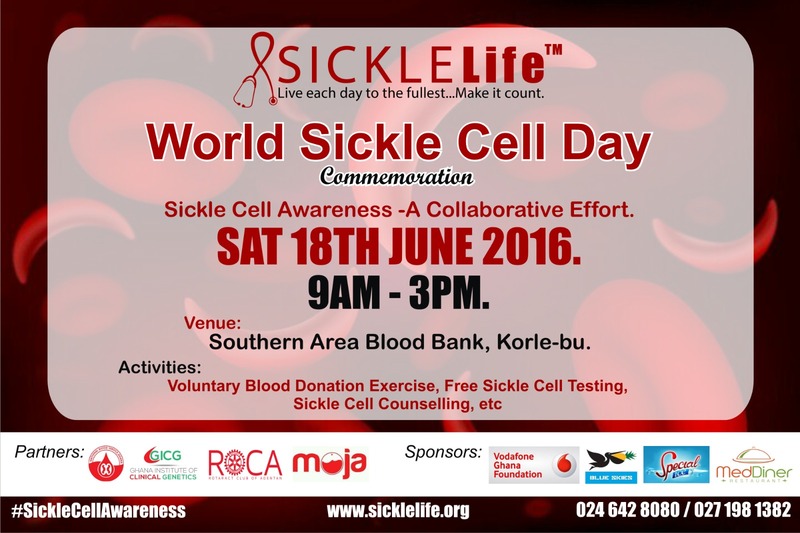 Join Sickle Life for our World Sickle Cell Day 2016 Commemoration. Support persons living with Sickle Cell Disease by donating blood and get tested for Sickle Cell Disease FOR FREE. (sickling test+hb electrophoresis). Contact 0246428080 for sponsorship or enquires. This entry was posted in Blog and tagged Ghana, June 19th, sickle cell disease, Sickle Life, World Sickle Cell Day. Bookmark the permalink. ← World Sickle Cell Day, June 19th. Tanx dr Enam,I was told about your project at the sickle cell unit korle bu and I’m looking forward to a successfully and impacting program come 18th June at the premises of the blood bank. I also have a testimony to share as a person with sickle cell disease and in due time will let you have it. We look forward to meeting you on June 18th and sharing your story. Amazing is all I can say. You can achieve anything in this world if you put your heart in it; but above all if you lean on the most high. Very inspiring. Quite similar to my own experience. I have SCD too but I’m not a doctor, how do I join sicklelife? Hello Nana. We will love to share your story it may inspire others too. You can submit it to sicklelifemd@gmail.com. Join Sickle Life by filling the volunteer application form on our website. A very thin line between what we want and what holds us back. The difference is actually one step! I am happy you took a leap towards your dreams. BRAVO and all the best with your project. Thank you. We hope to see you there. Thanks for the good works. I have been a carer for a 25 years. To summarise it all, i will say it has not been easy. God has seen us through. My son is not ready to be independent. It worrying. You’re a real testimony. Well done Dr. Enam. Would surely be there to support. God bless and great job done. The bone marrow transplant cures Sickle cell. God bless you Sefakor. I pray you continue to be a living testimony of the Disease. Stay blessed dear.